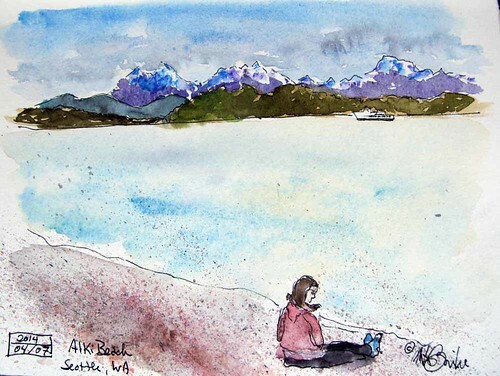 Urban Sketchers Seattle: At the Beach! This was the best Spring day yet in the Seattle area! It was a perfect day to go to the beach. Lots of other people thought so too as it was rather crowded. I did two sketches from the same spot but looking in opposite directions. The first one is a relaxing view of Puget Sound and the Olympic mountains in the distance. In the other direction is the city, with the Space Needle and houses in the distance. The beach is full of people and there is a paddle boarder on the water. 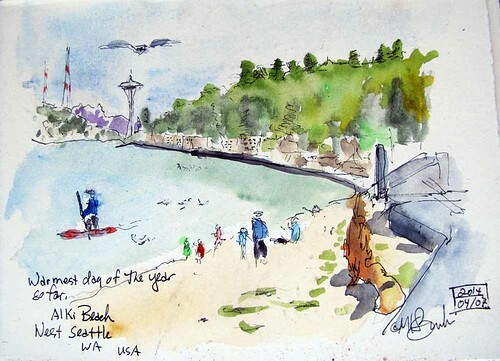 While sketching, I met the authors of Seattle Stairway Walks. Cathy & Jake Jaramillo stopped to ask, "are you one of the Sketchers?". They had seen Gabi's exhibit at MOHAI. Twice.